The Bara di Karta driving trail - Explore Bonaire! The maps can be found at the starting points of the driving trails. Bonaire is the top of a volcano that erupted in the sea. Movement of the continental shelf forced Bonaire to the surface. The Washikemba formation is the name of the volcanic soils, which you can find here in Bara di Karta and around Rincon. The red soils are mixed with black, brown and red rocks. If you pick up a rock here, you can feel how heavy it is compared to coral stone. The rest of the island is covered with white coral stone. These parts of Bonaire remained under water for a longer period of time, allowing coral to grow. The Washikemba plantation was one of the bigger plantations on Bonaire that was mainly used for the production of aloe vera. This plant has been used for centuries for its medicinal and skin care properties. The beautiful mansion was the center of the plantation and served as the living area for the owner. The mansion has been uninhabited for a long time. Rumors persist that the house is haunted and ghosts visit the house regularly. Saliñas are salt lakes, supplied with rainwater and seawater. They catch the rainwater with mud, which flows from higher grounds towards the sea. The mud can settle in the saliñas, so it can’t suffocate the coral reefs. Saliñas attract many water birds, including the Caribbean flamingo. They are also very important for birds that migrate between North America and South America. In the dry season there is no water in the saliñas. Close to where saliña Washikemba descends into Boka Washikemba the longest tree of Bonaire (28 m.) is growing in an east-west direction. The shape of the tree is the result of the almost constantly blowing Eastern Trade winds. The tree is called Buttonwood mangrove. The leaves have two red notches located at the base. The soil where the plant grows is salty. To survive these harsh conditions the salt is ejected through the two red notches. When it rains, the salt is washed away from the plant. The next part of the driving trail is rough. This only lasts for about 300 meters. Drive slowly! For millions of years, powerful waves eroded the limestone terrace exposed on the east coast. Parts of the coastline collapsed due to tsunamis and earthquakes. The result of these natural forces is the existence of many ‘bokas’. The meaning of ‘boka’ is ‘mouth’ in English. Litter consistently washes up along the coast of Bonaire. Most of the litter originates from the rivers of South-America where the environmental legislation often isn’t in place. The bokas are cleaned up regularly to provide nesting grounds for the sea turtles that lay their eggs on the beach. Unfortunately the litter keeps washing in. On this plain you can see free roaming donkeys, goats and sheep. Even though it seems nothing edible grows on this desolated area, they forage on the mosses that they find in between the rocks. On a clear midday it’s possible to see a fata morgana while staring over the plain in the Southern direction. This is the direction of the driving trail. These huge boulders are deposited by tsunamis. Bonaire has had to deal with significant tsunamis coming from the east, some of them over 9 meters high. Scientists have found that a devastating wave struck the island about 3,000 years ago. This is an example of a traditional farm. Sheep and goats are held and vegetables and maishi chikí (a wheat from Africa) are grown. This farm has its own water well and windmill to pump up groundwater for the goats and sheep. Some of the kunukus have been deserted over the last decennia while others are only used for a weekend getaway. On Bonaire the small-scale farms are called kunukus. The owner of this kunuku, Onnie Emerenciana, comes here every day to take care of his vegetables and goats. He wants to keep the old tradition of how his family had run the kunuku in the past and also introduce new agriculture technics of this time. To protect his kunuku he has built a typical Bonairean cactus fence. The thorns of the cactus and the height of the fence keep goats and intruders out. Tourists are welcome to visit this kunuku by appointment. During a visit, Onnie will show you the former aloe vera plantation next to his kunuku. Communal wells with windmills are important for the farmers. Most of the groundwater on Bonaire is brackish, but goats are able to drink this water. Only two windmills in the Bara di Karta area provide fresh groundwater that can be used for irrigation of vegetables. Close to the windmill a dam is constructed to catch the rainwater, hereby increasing the groundwater supply. The slopes of these dams were often used to grow watermelons and pumpkins in the dry season. The hill Bara di Karta (about 57 m) is prominent in this generally flat area. You can reach the top with a hike of about 15 minutes. From the top of Bara di Karta the East and the West coast, Lac and the saltpans are visible. A black and white land measuring point is located on top of Bara di Karta. All over the island you will find these black and white structures that are used for spatial planning. These three tamarind trees provide shade most of the year. The fruits are sweet and sour and very healthy. Tamarind juice is made in a traditional way and consumed all over the island. People are not the only ones that love the fruits of the tamarind trees. As soon as they are full of fruits many animals visit these trees to get their piece of the pie. During the day you’ll find lizards and iguanas and birds like the lora (yellow-shouldered amazon parrot) and parakeet. During the evening and night, fruit eating bats will visit these trees as well. If you visit Bonaire during the rainy season, you will be amazed by how green the island looks, but if you come during the dry season the island looks almost greyish-brown. The only green you will see, are the cacti. Bonaire has five cacti. 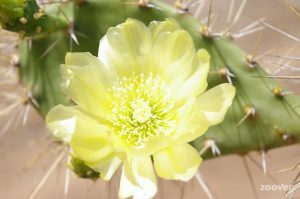 The dominant cacti species is the candle cacti: the cadushi (Cereus repandus), yatu (Stenoceres griseus) and cadushi di pushi (Pilosocereus lanuginosus). The slaves, working in the salt flats, started making soup from the cadushi. Cadushi soup is sometimes on the menu in the local restaurants. Nowadays a liquor is distilled from the cadushi at the Cadushi Distillery in Rincon. 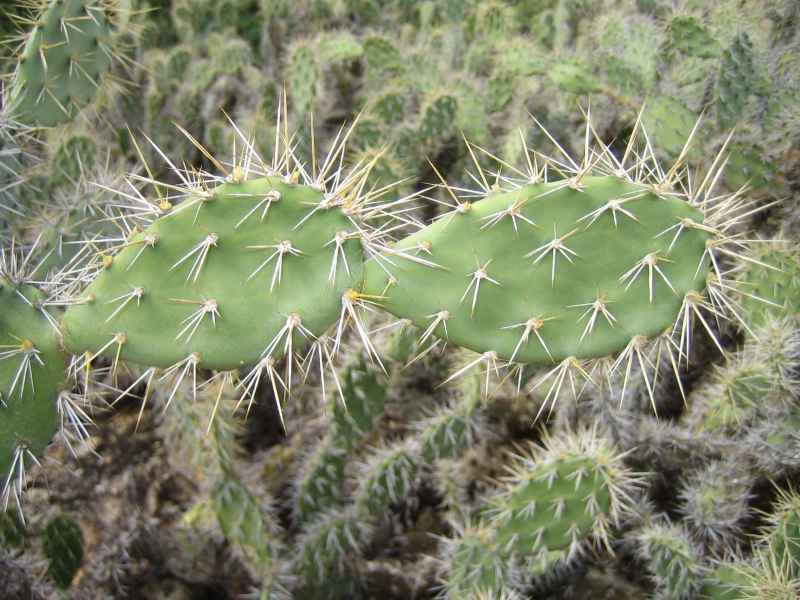 The yatu is used for the cactus fences. 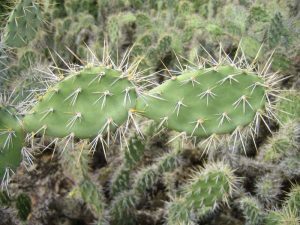 The prickly pear (Opuntia wentiana) and melon cactus (Melocactus sp.) 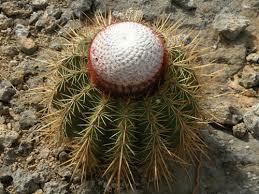 are the other two cacti that can be found along the driving trail through Bara di Karta. Prickly pear can be found all over the kunuku areas, the melon cactus grows on the rocks. 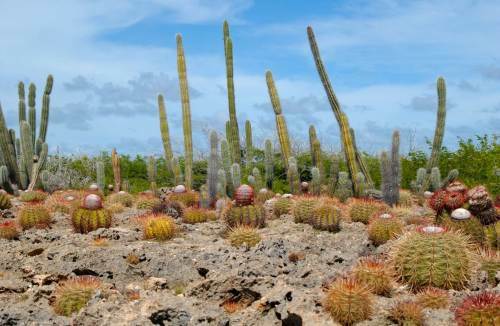 The cacti on Bonaire flower and fruit during the dry season, and provide food for a variety of bats, birds and iguanas.